What Are “Were-worms” In The Hobbit? 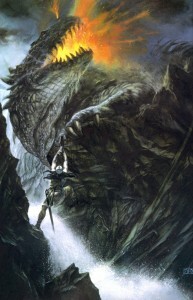 Glaurung the dragon, one of the chief weapons Morogth used to defeat the Eldar in Beleriand. Artwork: John Howe. That’s it. Nowhere else in all his Middle-earth mythology does Tolkien elaborate on these worms. What were they exactly (no pun intended)? What did they look like? With a little thinking I think we can figure out 3 possible explanations. First, Were-worms could be fictitious within the secondary-world. Perhaps they are simply an invention of Hobbits that appear in some of their folk-tales. This is an entirely safe explanation, but remember that oliphaunts were just a legend to the Little Folk too. What if they really did exist in Middle-earth? Or, at least, how did the Hobbits imagine them? A second, perfectly reasonable conclusion is that they are a special breed or kind of dragon. The word “worm” descends from the Old English word “wyrm” and the Old High German word “wurm.” Both mean the same thing, snake, serpent, or dragon. Tolkien uses both “worm” and “dragon” to refer to the same creatures in his stories (although usually the title “worm” is most often ascribed to wingless dragons). Furthermore, the term “were” traditionally refers to creatures that can change between human and animal form. So, could these Were-worm creatures be humans that have the ability to change into dragons (or vice versa)? Possibly, but I doubt it. The only creatures known to possess that power in Middle-earth were the Skin-changers (i.e. Beorn) and the Maiar (who were able to assume a variety of shapes). “Were” in Tolkien’s works is used to describe stronger and more intelligent kinds of creatures corrupted and twisted by Sauron or Morgoth (i.e. werewolves in The Silmarillion). Thus, Were-worms could be some special kind of wingless dragon. I doubt they could be more crafty or intelligent as Glaurung, but perhaps they had some other kind of unique physical power. The next version of the passage was slightly modified. These drafts date back to the time when The Hobbit and the Silmarillion stories were much more closely tied to the real world. As the stories developed Tolkien dissolved the strong geographical connections between his secondary world and the real one (hence the removal of any reference to the Chinese). But, if we know that these Wireworms or Were-worms were originally intended to have lived in or around the Gobi desert then we can discover some fascinating clues about how Tolkien may have imagined their physical appearance. First, the original name of these creatures in question, wireworm, may provide a lead. Wireworms actually do exist. They are the larvae of Click beetles. Wireworms, according to Wikipedia, are usually saprophagous (meaning they live on dead organisms), “but some species are agricultural pests, and others are active predators of other insect larvae.” They live underground and are excellent at burrowing through the soil (which may have provided inspiration for the depiction of Were-worms in the movie). However, they don’t seem to fit the type of creature Bilbo mentions. Despite being a pest for farmers, they don’t seem like the type of thing that a hero would travel thousands of miles to fight. While wireworms are interesting, there is only one creature that truly fits with the clues Tolkien has given us. To this day, Mongolian locals maintain the belief that a creature called the olgoi-khorkhoi lives in and near the Gobi desert. The true existence of this Mongolian death worm has been disputed for years, but local accounts of the creature have been detailed and consistent. Supposedly, it is a bright red worm with a thick body the width of a man’s arm and a length between 2 and 5 feet (06. to 1.5 meters). It hibernates underground most of the year and only comes out in June and July when the ground is wet after a rain. The creature can reportedly kill at a distance via electric shock or by the ability to spew forth an acid strong enough to kill a human on contact. Knowledge of the beast was first brought to the attention of the Western world when an American explorer by the name of Roy Chapman Andrews (the inspiration for Indiana Jones) published a book in 1926 titled, On the Trail of Ancient Man. His same account of the legend was published again in his 1932 book, The New Conquest of Central Asia. While I can find no record that Tolkien actually read Andrews’ works he was interested in new scientific and archeological discoveries and considering how famous Andrews’ stories were it is entirely plausible that Tolkien caught wind of the Mongolian death-worm just before or as he began The Hobbit in the early 1930s. Over and over again throughout his works Tolkien takes these “footnotes” from history, accounts of people or things that are partially lost, and gives them a place in his own Middle-earth mythology, often expounding upon them along the way (e.g. the Old English Earendel became Eärendil in the Silmarillion). Therefore, I propose that these Were-worms Bilbo mentions in Bag End are derived from the Mongolian death worm. They fit everything we know about them from the published Hobbit and its earlier drafts. They live far in the east in Mongolian and Chinese deserts and are quite wild and dangerous. To conclude, we’ve discovered three primary candidates to fill the role of Tolkien’s Were-worms. 1. They are a fictitious, mythological creature found in Hobbit folk-lore. 2. They are a special breed or kind of dragon. 3. Or,they are based on the legendary Mongolian death worm. The first two can be deduced from and within Tolkien’s texts alone, but the similarities between the Mongolian death worm and the Were-worms are striking. Another alternative could be synthesizing either the second or third explanations with the first one. 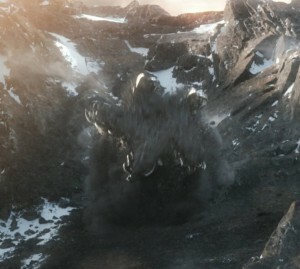 As tales of the dragons or worms were picked up by Hobbits after spreading west it is entirely probable that the stories were exaggerated and the beasts passed into legend. In the end I suppose we’ll never really know what Tolkien intended them to look like, but in some ways that’s part of what makes Tolkien’s work so alluring. 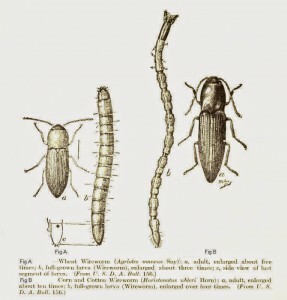 Just like olgoi-khorkhoi are mysterious in the real world so are Tolkien’s Were-worms.